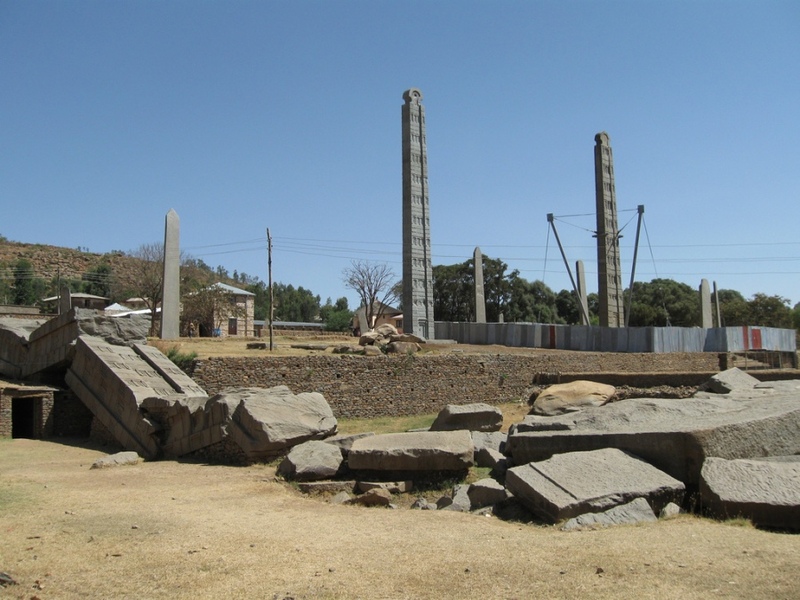 Ethiopia’s most ancient city and the capital of the historic Axumite state, is the site of many remarkable monolithic stone stelae, or obelisks, the three most important being decorated to represent multi-storied buildings, complete with doors and windows. The largest obelisk, which was 35 meters long and weighed 500 tons, is the biggest piece of stone ever cut by humanity anywhere in the world but today it lies broken on the ground. Near it stands a smaller but nevertheless most impressive 24-metre-high obelisk – the pride of Ethiopia. A somewhat larger obelisk was taken to Rome, on the orders of the Italian fascist dictator Benito Mussolini, in 1937. All three section of the 1,700-year old Axum obelisk has arrived back in Ethiopia, 68 years after it was looted by Italian fascists. It was eventually dismantled into three pieces in 2004 in preparation for its journey home, an operation which is costing Italy an estimated 6 million euros (£4.1 million). The monument is due to be re-erected after the rainy season. Axum, in its day, was a great commercial centre, issuing its own currency and trading with Egypt, Arabia, Persia, India and even Ceylon. The settlement was also the site of Ethiopia’s oldest church, which dated back to the coming of Christianity as the state religion, early in the 4th Century. The original building has long since disappeared but a structure erected on its site by Emperor Fasiladas in the early 17th Century is still there. A nearby outhouse is the reputed repository of the biblical Ark of the Covenant. This historic relic cannot be seen but visitors there can see and photograph a number of the remarkable crowns that belonged to several notable Ethiopian monarchs of the past. Just out of the town, the remains of an early Axumite palace, popularly thought to have belonged to the Queen of Sheba, are well worth a visit. The remains are located at Dangur, near the mountain from which the obelisks were originally excavated. The beautifully worked tombs of several ancient Axumite rulers and the local archaeological museum are also worth a visit. About 45 per cent of the Ethiopian population is Muslim. Most of the Christians belonging to the Ethiopian Orthodox Church, whose 4th Century beginnings came long before Europe accepted Christianity. A further small percentage of the population adheres to traditional and other beliefs, including Judaism.